There are millions of ways to live and probably at least as many ways to go. Traveling from the UK to the mountains near Tibet in China inevitably makes me grasp the enormous vastness of the former. Talking to elderly people in a typical English town and then reading about the upheavals of modern Chinese history leaves me agape at the latter. You observe lifestyle, ideals and ambitions of a top executive in a long–established educational institution in England and then that of a poor and unsophisticated peasant in rural China and realise that their universes use entirely different arithmetic systems. Some numbers can be translated between the systems, some can only be approximated, and others make sense only within a certain modus operandi and remain an incomprehensible mystery for the outsiders. 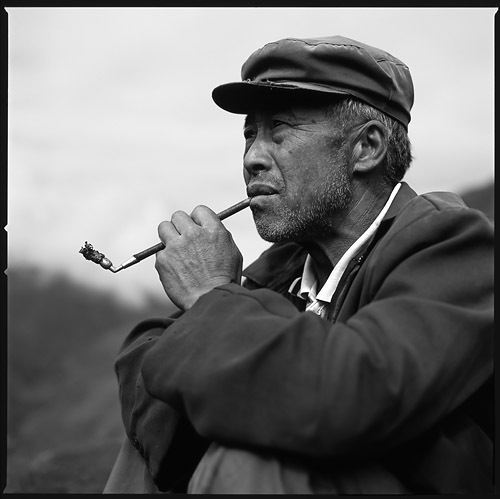 We met the person in the photograph about two hours into Haizi Valley near Siguniangshan (Four Girl Mountain, Sichuan Province, China). He was sitting on a slope smoking his pipe and vaguely looking at the opposite side of the valley. Apart from a little tobacco baggie by his side there also was a hoe laying near him. At first I could not quite figure out what he was doing sitting in the middle of nowhere, where he came from and where he was heading. Sensing an interesting character and quite intrigued, I preset exposure on my camera and went over to have a little chat and, hopefully, photograph him. After a couple of minutes into the conversation I asked whether he would mind if I took a couple of pictures of him. No problem, he said—an air of remote coolness in his answer. We carried on with our simple conversation but each of us appeared only half–present—I was looking into the viewfinder contemplating a suitable composition while my new acquaintance seemed to be envisaging something else in his mind. As it turned out he was simply a road–repairer. Horses are used immensely in the valleys around Siguniangshan Mountain to transport luggage, occasional tourists and even pigs in cages. Footpaths along the valleys become uneven all the time as horses tend to step into already existing pits and his job is simply to travel along the tracks and level the pits off with the hoe where the footpath becomes too difficult to walk. After a couple of photographs were taken I offered to send him one and asked if he could give me his address. "I do not have an address", he answered, smiling. Having finished smoking he cleaned the pipe and put it back into the tobacco baggie. His facial expression seemed to have changed somewhat, as if he had just returned from somewhere distant, his stare still bearing an imprint of what he saw there. He stood up, picked the hoe, bade me goodbye and started walking further into the valley. Apparent simplicity and lack of some of the attributes that many of us would consider indispensable to our lives had me thinking about how primitive and challenging his life must be. I, however, could also undeniably perceive some subtle dimensions of his existence that, while mostly illegible, gave me a very strong impression of a considerable depth. It then also occurred to me that depth—as opposed to immediately visible traits—probably is a more relevant factor when juxtaposing incomparable systems of values, as well as that from this perspective my initial thinking was too biased. How would he evaluate my supposedly–better life and would he want to have it instead? Would all the things that I believe important matter to him or would he laugh at them? Would the lack of things in my life that I deem insignificant be lethal to him? I will never know.